Onto the third room reveal of the makeover. The family room! 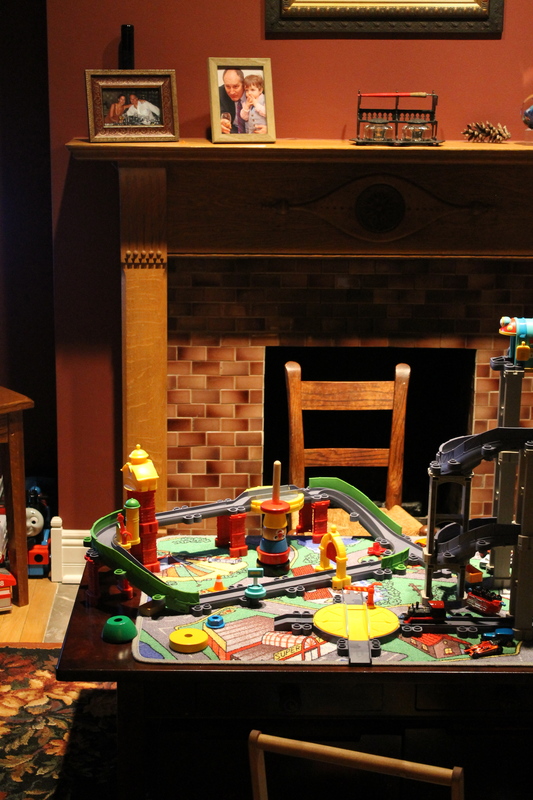 This is a room that combines cozy adult living with lots of toys and books. My vision here was playful adult. 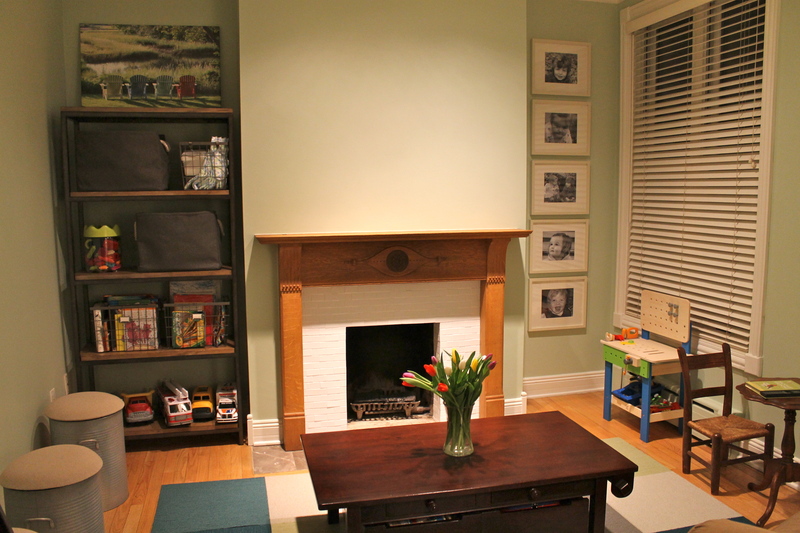 Give it some pops of color and energy, but don’t sacrifice the adult character of the space. Here are my tips, tricks and sources. FLOR it up! 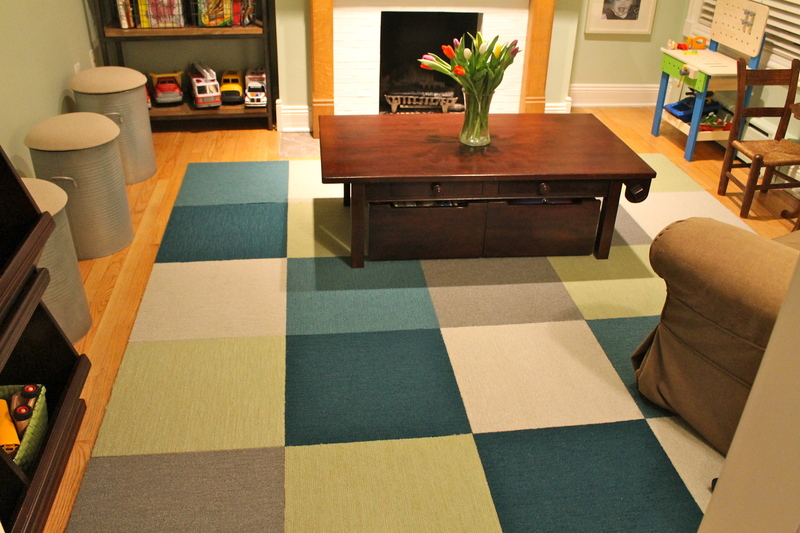 I knew right away I wanted to add a colorful rug as the centerpiece of the space and of course, I scored a perfect design and color pattern at FLOR. You can see all of the design options they gave me in this post. And below was the winning choice! Paint, of course. 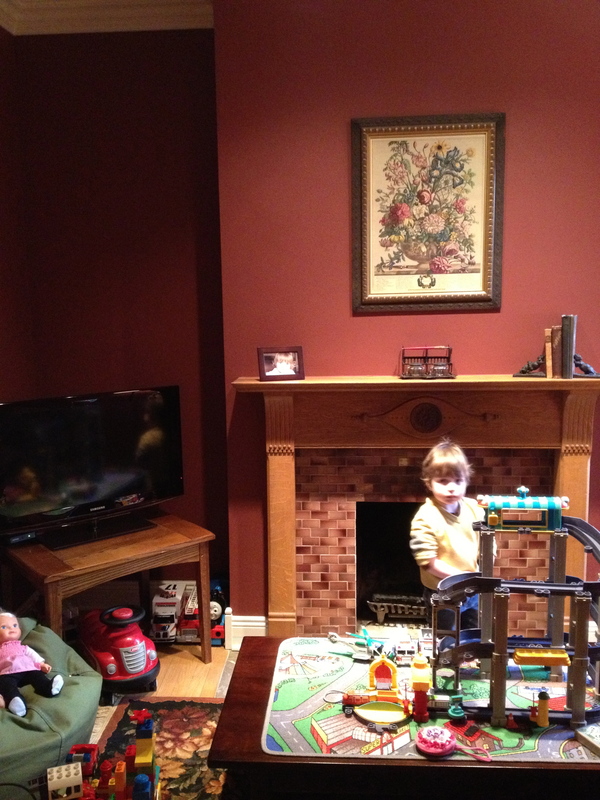 Oh Benjamin, what shall we do with these maroon walls? All that kept popping into my head was sage green. I was on a mission to use sage green on those walls at all cost. So weird. But, as always, the gut prevails. Speaking of gut, I did yoga tonight and man oh man I have some gut work to do before bikini season gets here. Which, I suppose, could be months from now based on the weather in Chicago. Whew, I have some time. Oh and I went with Benjamin Moore Budding Green. Pictures, pictures, pictures. 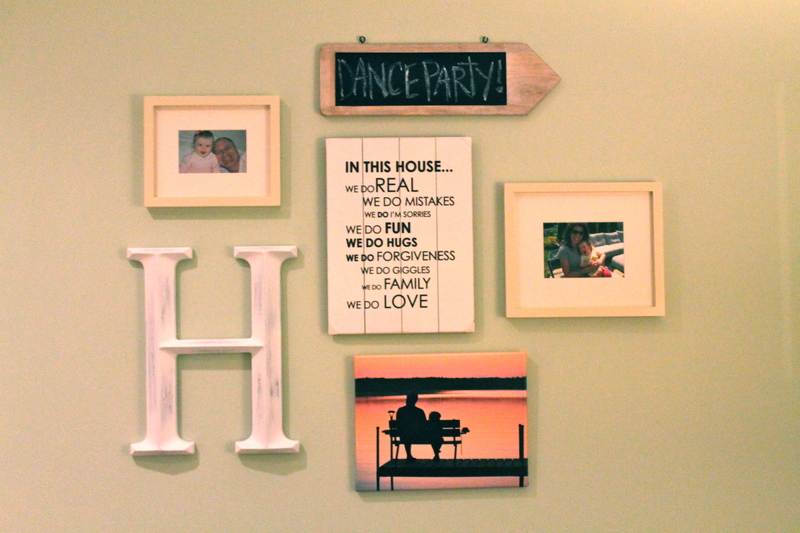 This was the perfect space to be a little playful with the pictures. So, I blew up and edited awesome shots of their kids. I rocked the great Pottery Barn wood gallery frames. And voila! 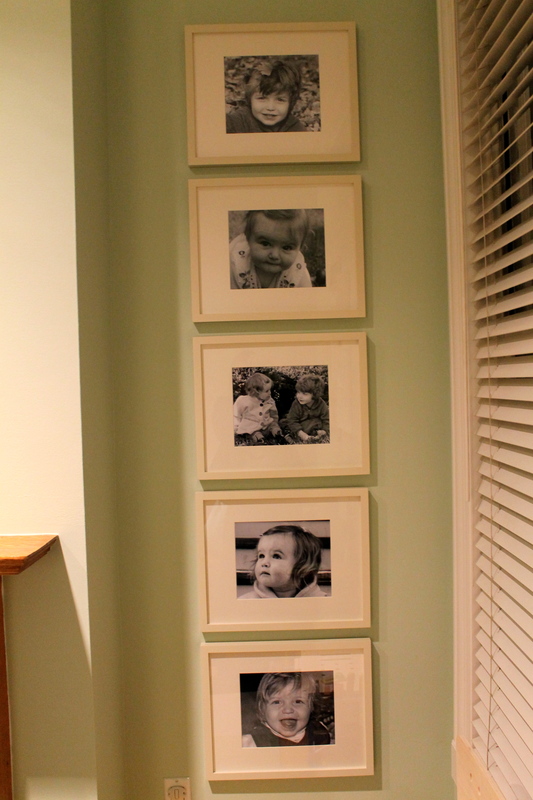 A simple gallery wall which would make anyone smile (Luke and Cameron make awesome art). I also blew up two pictures that Jennifer and Chris had taken. One of these was of amazing Adirondack chairs from their wedding and one of Chris and Luke having the most special father-son moment on a deck. Melts my heart. Storage for ttttooooyyyys! Bookshelf from Ballard Designs + harvest wire baskets and linen charcoal gray bins from Container Store = organization, color flow and a lot of great Dr. Seuss books. OH and let’s not forget about the major score of the extra storage + extra seating World Market milk drum stools for a mere $50 each (on sale). I almost peed my pants when I found these. Seriously. Minor, but necessary. Paint that tile on the fireplace! The pictures speak for themselves. And, here is the reveal! And P.S. the reason there is nothing above the fireplace in the after pics is because they are mounting a new TV there. Just had to clarify that. You are simply amazing Miss Ann. I bet the owners of this lovely home are loving all the changes. Wow, you are just one amazing and talented woman!